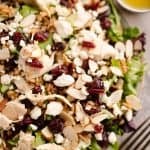 Cranberry Farro Chicken Salad is a healthy dinner salad recipe full of flavor and crunch with toasted almonds, feta, rotisserie chicken and a light apple cider vinaigrette. Meal prep the salad in a jar for an easy lunch! Farro is an ancient whole grain, much like barley and wheat berries. It has a nice chewy texture when cooked and adds a great texture and boost of fiber to salads. 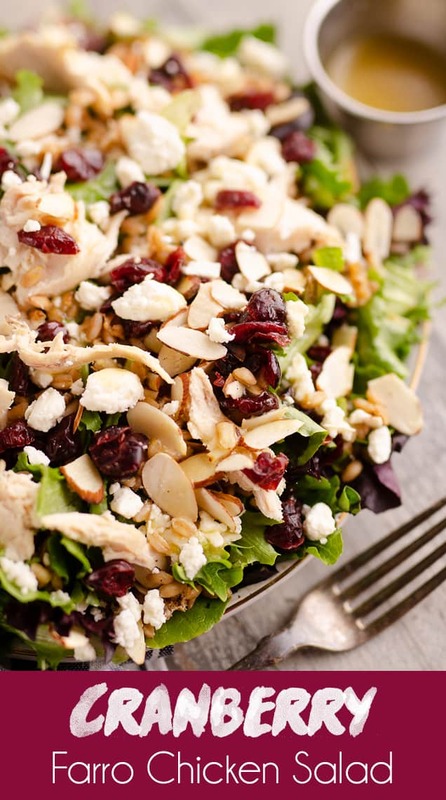 This Cranberry Farro Chicken Salad is a fantastic winter dinner salad featuring the grain along with almonds, feta, rotisserie chicken, dried cranberries and a Light Apple Cider Vinaigrette. It is a hearty and healthy recipe that will fill you up and leave you satisfied! 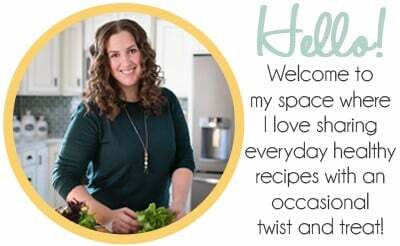 Farro isn’t a pantry staple for me but it was recently included in one of my meal delivery kit recipes and I enjoyed it so much I purchased some more to use with various recipes. You can soak farro to speed up the cooking time, but I am not one to plan ahead that much, so I just spend the extra 10-15 minutes cooking it on the stovetop. I always have to have a crunch of some sort on a salad. 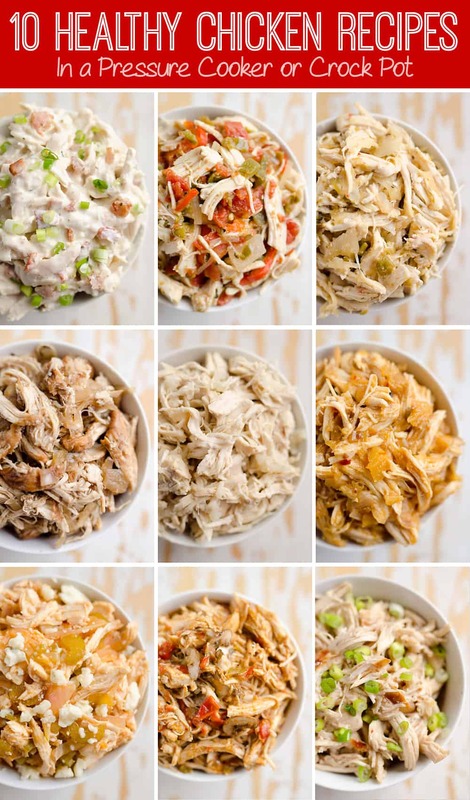 Whether it is tortilla strips on a Southwest Cobb Salad, wonton strips on a Sesame Asian Chicken Salad or the classic croutons on an Italian salad. I think crunch is an integral part of a well balanced salad. 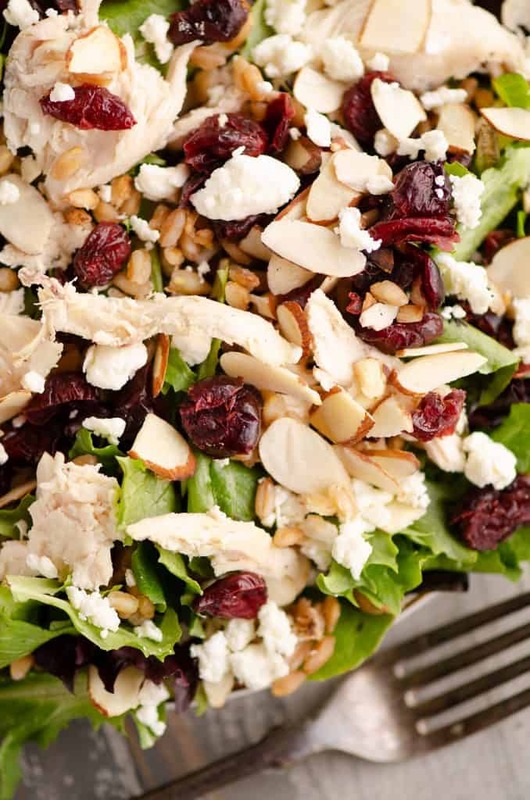 With this Cranberry Farro Chicken Salad we get some crunch from the sliced almonds and a great chewy texture from the farro that you don’t find in most salads. It is different from the texture you get from the tender rotisserie chicken. In addition to texture, it adds some flavor when you cook it in some chicken broth for a bit of saltiness along with it’s naturally nutty flavor. If you don’t have farro on hand, Barley or even quinoa would make a great substitute. My new favorite thing to do with healthy salads is to prep enough ingredients to make a couple salads and meal prep a salad in jar for lunch the next day. 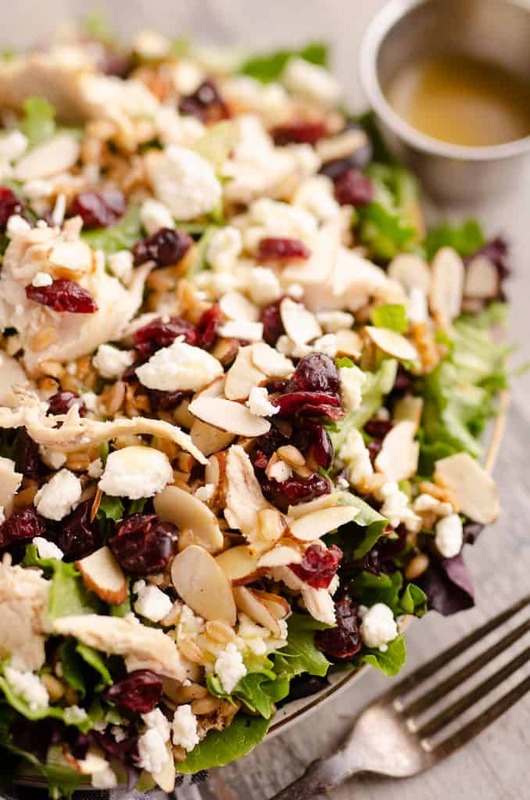 This Creamy Greek Chicken Salad is the perfect example! Even though I don’t have to go to my 9-5 job anymore, it doesn’t mean that I always have time and energy to make a healthy lunch when I am wrangling the twins. When I have some salad in jar recipes prepped in the refrigerator, I am far more likely to choose a healthy lunch instead of something convenient and pre-packaged. 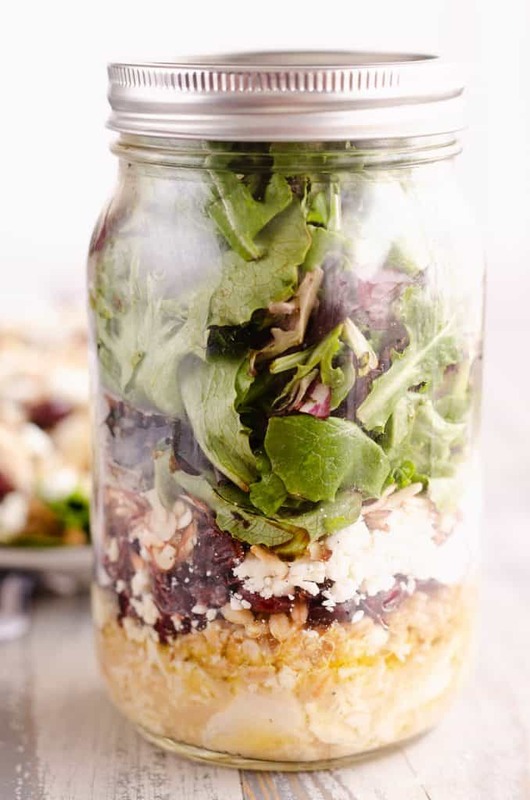 Not every salad makes for a great salad in a jar, but the ingredients in this Cranberry Farro Chicken Salad are perfect to layer in a quart mason jar. You typically want to start with the dressing and layer the meat on top of it. Follow the meat by the heartiest vegetables like cucumbers or in this case a grain like farro. 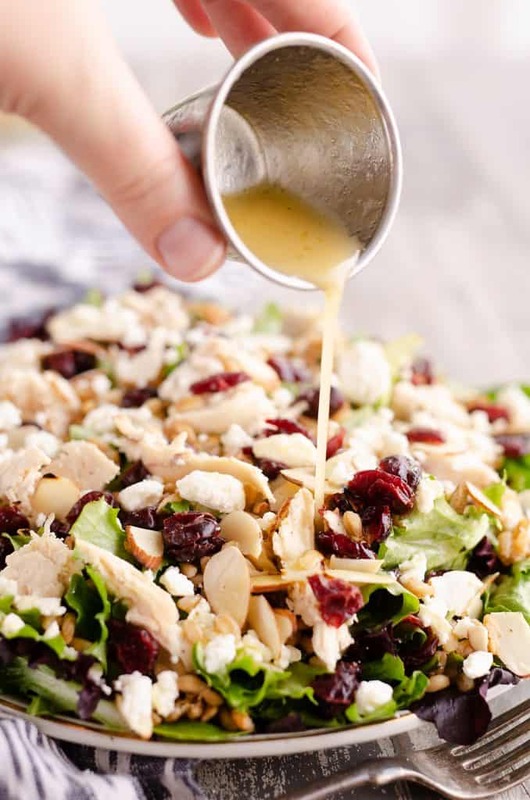 The first few ingredients that go over the dressing should be able to stand up to absorbing some of the dressing and not becoming soggy. I followed the farro with the dried cranberries and feta. 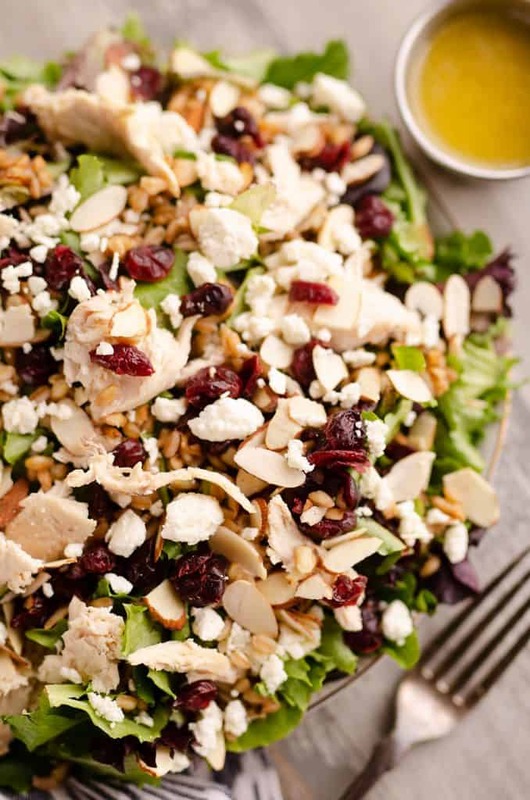 Once the dressing is clear out of sight in the jar, you can start adding the more delicate vegetables and ingredients like almonds and green onions in this salad. If the almonds were to come into contact with the dressing in the jar they would be mushy and no good. The last thing you want to the jar should be the greens. They are the most delicate ingredient and by leaving them until the end, you can stuff them down to add lots of lettuce to the salad. You will have to really push them down to pack them in or you will be left with a salad that is unbalance with not enough greens. To a small saucepan over high heat, add the farro and chicken broth along with a pinch of salt. Bring to a boil and then simmer for 25 minutes. Remove from the stove and allow to cool. 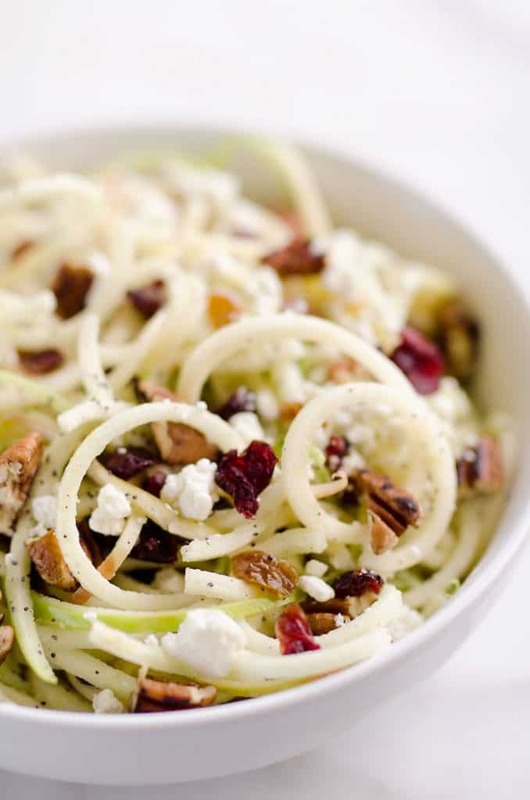 Divide the remaining ingredients among two bowls and toss with vinaigrette. Top each bowl with the cooled farro and serve. *This post may include links to my Amazon.com affiliate account and The Creative Bite earns a few cents on the dollar if you purchase the items I share with you. Thank you for supporting my blog when you shop at Amazon! 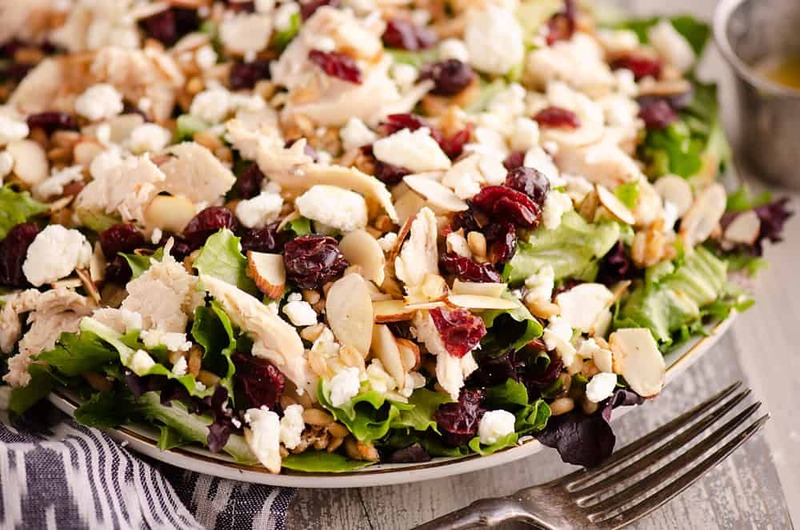 My favorite pasta salad has dried cranberries in it and I couldn’t wait to try this lighter salad similar to it. It was AMAZING! My husband loves salads and I needed to switch it up and tried this one. We BOTH loved it! Going on my short list. I also always have to have some crunch to my salad! 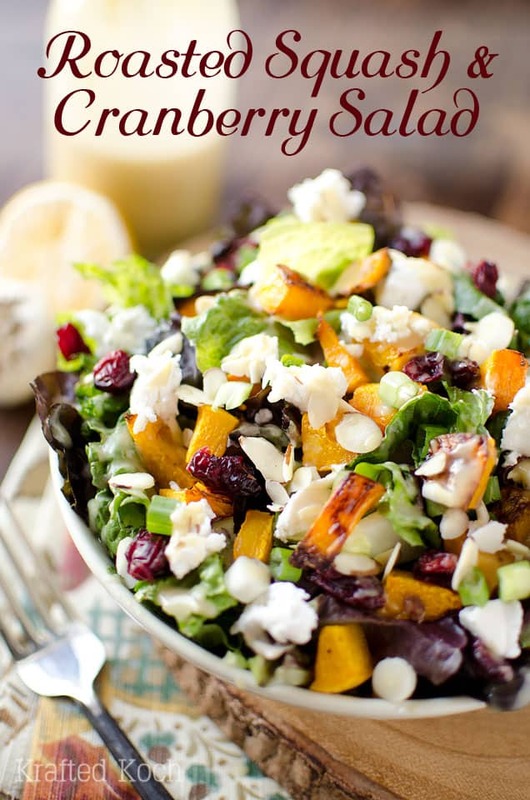 I’ve never tried farro before, but it looks amazing in this salad! I love it when I can prep healthy and flavorful salads! Thanks for a great recipe!